For those of us who have listened to the works of Norman Corwin and have been inspired by the words of this poetic genius a collection of his most famous radio works comes just at the right time. 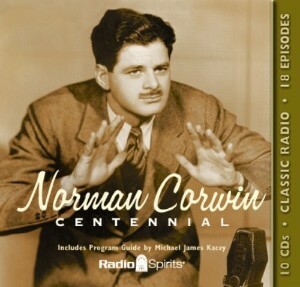 Norman Corwin’s Centennial, released by Radio Spirits, will transport our ears and minds back in time to classics such as the Bill of Rights Special: We Hold These Truths, The Undecided Molecule, The Plot To Overthrow Christmas and others. In addition, a nice accompaniment to the CD is a Program Guide, written by Michael James Kacey, which contains information and photographs of this radio legend. Whether you’re rediscovering the words of Norman Corwin all over again or experiencing the history of The Poet Laureate of Radio for the first time, this is the one CD that should definitely be added to your collection.